Laos was part of French Indo-China, grouped with Cambodia, and Vietnam within the French Empire. Laos declared its independence from France after the withdrawal of the Japanese in 1945, only for France to regain control. However, after the war, in 1950, France gave Laos semi-autonomous status within the French Empire, with a new monarch. The country itself can trace itself all the way back to the Kingdom of Lan Xang, or "Land of a million Elephants." This history was mirrored in its flag. 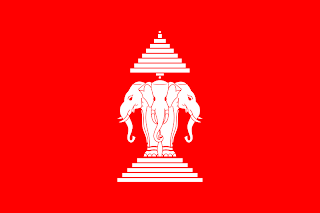 A red banner on which are 3 elephants under a 9 folded umbrella. The three elephants indicate the three ancient kingdoms that make up the nation of Laos, Vientiane, Luangprabang, and Champasak. However, because Laos was still under French control, the French tricolore was placed in the upper hoist canton. 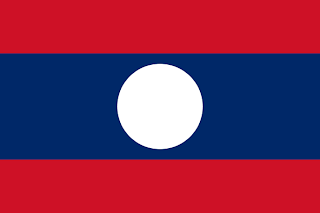 Upon independence from France in 1954, Laos became a monarchy, and the flag was kept. 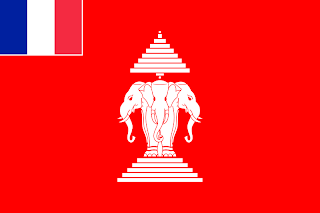 However, this time, they removed the French flag from the Laotian flag, leaving it as a plain red banner with the elephants in the centre. From independence, the government engaged in a low level war with the Pathet Lao, a communist movement. They adopted a blue banner with red stripes top and bottom, with a white disc in the centre. The Pathet Lao finally entered into a coalition with the government in 1973, and finally achieved power in 1975. With the sweeping away of the monarchy, the new communist government adopted their own flag as the flag of the nation. 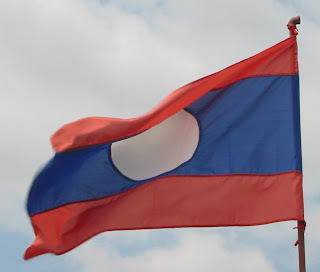 The blue represents the prosperity of the nation, the red stands for the peoples struggles, and the white disc represents the unity of the people of Laos.